Blog / Events / To see Calcio Storico Fiorentino or not…. 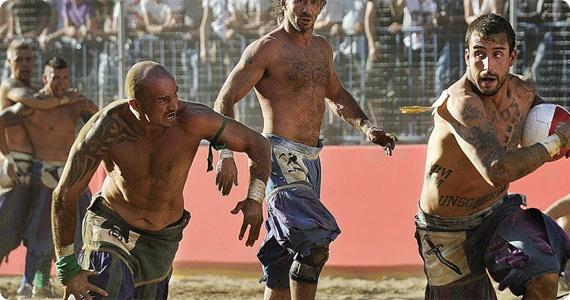 Still wondering whether you should go see the Calcio Storico Fiorentino whose first two matches are taking place this weekend in Piazza Santa Croce (for more details, read our blog post on the Calcio Storico from a few weeks ago)? View this promotional clip of the documentary called “Football Gladiators” directed by Fabio Segatori to get a taste of what the matches turn out to be like! A game whose roots go back to 1530 could only be like this – a bit intense whose rules are basically there are no rules. You can see the documentary in its entirety in a special showing at the Odeon cinema June 22 at 8:30pm. The documentary was filmed with cinema funds of the Regione Toscana.